The diesel engine derives power from mFalcon D75 1.2L CRDi unit that throws out power of 78 Ps and a peak torque of of 190 NM. 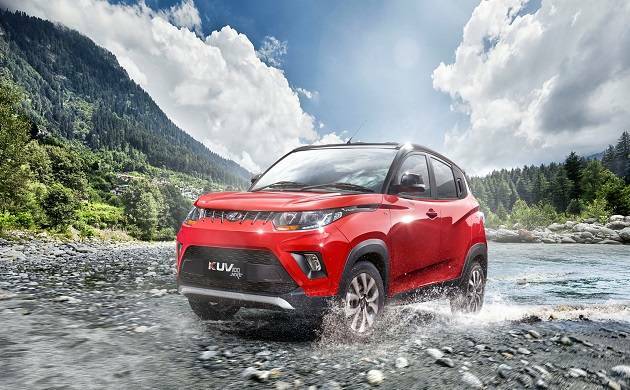 The facelift version of KUV 100 by Mahindra & Mahindra (M&M) is feature packed and is also pocket friendly. The hatchback SUV will come at a starting price of Rs 4.39 lakh and will go upto Rs 7.33 lakh. Mahindra & Mahindra has introduced several changes in the interiors with some mechanical modifications. Here are the 10 features you just cannot ignore. 1. The first visible addition is the front grill and bumper which is sure to catch the attention of the targetted buyer i.e. the youth. 2. The headlamps have been made sporty that will make the previous look dull. The tail lamps get new shape with chrome bezel. 3. The diesel engine derives power from mFalcon D75 1.2L CRDi unit that throws out power of 78 Ps and a peak torque of of 190 NM. 4. The all aluminium petrol engine is powered by mFalcon G80 1.2L 3-cylinder which produces 83Ps of power and a peak torque of 115Nm. 5. The interiors looks afresh with the addition of a new 7 inch touchscreen infotainment system that will support audio and navigation with map my media. 6. Driver Information System (DIS) now comes with voice alerts. 7. Instead of Android M&M have chosen Mahindra Blue Sense technology through which smartphones can be connected. 8. To add up to the muscular look the 15 inch alloy is coated with black and chrome finish. 9. Both the petrol and diesel variants are to get Automated Manual Transmission soon. 10.Rear view mirrors get electric fold and IntelliPark reverse parking assist system has been added.